The U.S. government and media have accused Russia of being behind the downing of Malaysian Airlines flight MH17 (July 17, 2014), either directly (for which zero evidence has been offered) or indirectly, via "pro-Russian rebels", for which all the evidence offered has been outright falsified - from "audio intercepts" (here) to "videos" (here and here) to interviews doctored to sound as if the "rebels" had Buk launchers. All of it taken at face value by the Western media, and even amplified by misrepresentations of photos. Conspicuously absent from any coverage has been the thought of the Kiev junta shooting the airplane down. Yet the junta fits the classic police trifecta of means, motive and opportunity perfectly. Means: the Ukrainian armed forces possess multiple Buk launchers in working order, over a dozen of which were deployed in the region at the time. Motive: Blame Russia and the "rebels", which Kiev has been doing for months anyway, but especially at the moment when four of their brigades had just been cut to pieces by the "rebels" in the Marinovka/Saur-Mogila "cauldron" along the southern border. Opportunity: MH17 was diverted from the regular flight path, and directed to a lower altitude, by the Dnepropetrovsk Air Traffic Control (ATC), i.e. officials loyal to the Kiev regime. Its normal flight path would have taken it nowhere near the war zone. Then there was the immediate attempt to pin this on Russia and the rebels, through doctored "audio intercepts" and YouTube videos. Yet the U.S. government continues to insist that Russia is to blame, based on super-double-secret "intelligence" it refuses to show, or "social media" - and deliberately ignores the factual evidence pointing to its clients in Kiev. 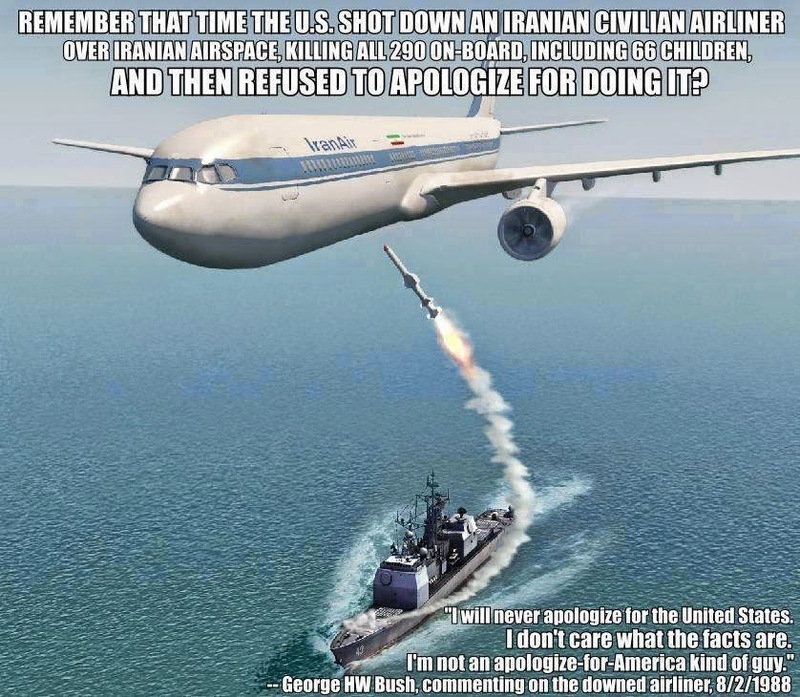 On July 3, 1988 the missile cruiser USS Vincennes shot down IranAir Flight 655 over the Persian Gulf, killing 290 civilians on board. When denial didn't work, Washington shrugged it off and apologized... not. The question now is, who do you think is credible here, and who is lying through their nose? Pictures on the internet circulating, showing TWA flight 800 with similar missile damage as flight MH17. Also, june 13th in Europe 9 airliners disappeared from radar, because NATO was conducting electronic wargames (source Reuters). Flight MH370 disappeared from radar, and lost communication with the satellites, this could be according to experts because of software or power malfunction. In my opinion it could be because of electronic wargames conducted by the US on their Diego Garcia military base. Washington's goal is to provoke a Russian invasion, so they can push Russia out of Europe, cut any economic and diplomatic links between Russia and the EU and isolate Russia on an international level. 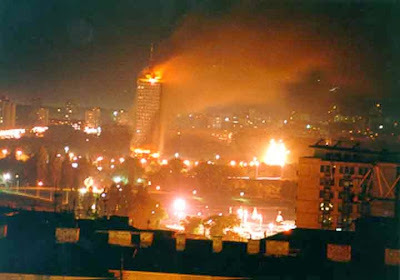 Washington wants to trap Russia in an Afghanistan-style war, while NATO is supporting the Kiev junta by military means. Putin is not stupid to fall into Washington's trap, this will not only cost Russia's economy but will also destabilize Russia and the world. I am not at all surprised flight MH17 was downed if you consider Yulia Tymoshenko's hateful talk towards Russia in her leaked phone call: "“I hope I will be able to get all my connections involved. And I will use all of my means to make the entire world raise up, so that there wouldn’t be even a scorched field left in Russia". The Kiev junta wants to provoke a NATO intervention now they are out of money for the military operations, which are being led by Svoboda fascists and Right Sector neo-nazis. The attorney general of Ukraine has acknowledged the rebels do not possess BUK missile systems. Washington knows Kiev shot down the Boeing, they hide the evidence (satellite pics) from the public, and twist the truth by pointing to Russia. Washington don't want to embarrass themselves by revealing the truth, instead they pin the blame on Russia, for their own diabolical interests. Western civilization is in decline, they believe anything their MSM tells them without thinking. It truly has become the survival of the retarded. Where are the tapes from Kiev ATC to the MH17???? click on more to jump to another site with more info. CNN is now making the claim that mass graves were found in Eastern Ukraine. There was no article only a video. The US must be desperately trying to find something on Russia. Its insane. Amber, I heard of "mass graves" last week, before the MH17 disaster. I remember having to read through the story twice, because the way it read was that they contained victims of the "rebels" - except that on a more careful reading, the bodies turned out to be those of the militia and civilians, killed by the Ukies. But the language of the stories, the "editorial guidance", was such that it seemed otherwise. Is it a coincidence Israel attacked Gaza minutes after the Boeing shoot down? I don't think so. According to Space.com: "It's likely that the strike on MH17 showed up as an alarming blip on screens at Buckley Air Force Base in Colorado where those data from the SBIRS is processed. The detection is precise enough to detect where a missile was fired from and what kind of missile it was." I figured it must have been the victims of the Ukrainian army...what's sick is that the west is going to try and twist it around. Its so sad for thier families. I honestly don't understand the twisted nature of the neo cons and thier relentless drive to destroy Russia. They won't win. Its madness. I have noticed a certain "protocol" (or rules) in the propaganda language Washington uses; they invert the truth, for ex. US accusing Russia firing into Ukraine across the border, while the opposite is the truth, and they keep repeating it. This also applies to the propaganda coming from Kiev. It makes me wonder if the Kiev junta attended a workshop "propaganda" from CIA operatives. They must have studied "propaganda", probably written many books about it too, because i can see a pattern which keeps repeating like it follow a certain written protocol. Between the British (i.e. the US) now handling the black boxes and the junta wanting to take possession of the debris (which they will have shelled into splinters first), it's becoming increasingly obvious the Official (Western) Story about MH17 is a lie. Official Moscow released a satellite footage showing the Ukrainian Army firing on Malaysian Airlines MH17. The rocket was fired from a BUK system, from territory controlled by the Ukrainian Army. Moscow provided further details - the area where the missile was fired from is controlled and financed by oligarch Ihor Kolomoyskyi. According to European intel sources, the US is very much aware who downed the Airline, and has the same satellite feed that the Russians have.